Just popping in to let you know there are GREAT new items added to the "While Supplies Last" section of my website. Several items under $1.00, a great 12x12 New England Ivy Album and tons more- so go take a look! Click here. 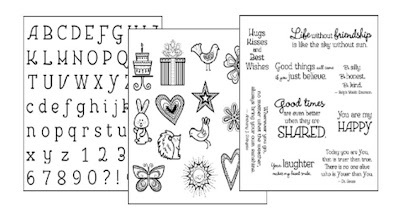 Also- while you're there- keep in mind that when you spend $50 or more you qualify for the $5 stamp of the Month set (see my last post) and the $10 National Stamping Month Triple stamp set shown below! and would love to help you find what you need for your next project! Check back this weekend as I show you my super fun Halloween Treats project for my October class!